In the interest of educating our dear readership on the many makes of beer, every once in a while the Spirited Table will feature a flavor profile on a specific type of beer, complete with history, tasting notes and food pairings. Keep your eyes peeled for these features in the coming months! Stout is a dark beer, which is made using intensely roasted barley, in addition to the traditional hops, water and yeast found in other beers. Typically, the word Stout is used to describe the strongest, darkest beers made by a brewery, around 7% or 8%, although one of the world’s most famous Stout beers, Guinness, has an alcohol content of just 4.2%. 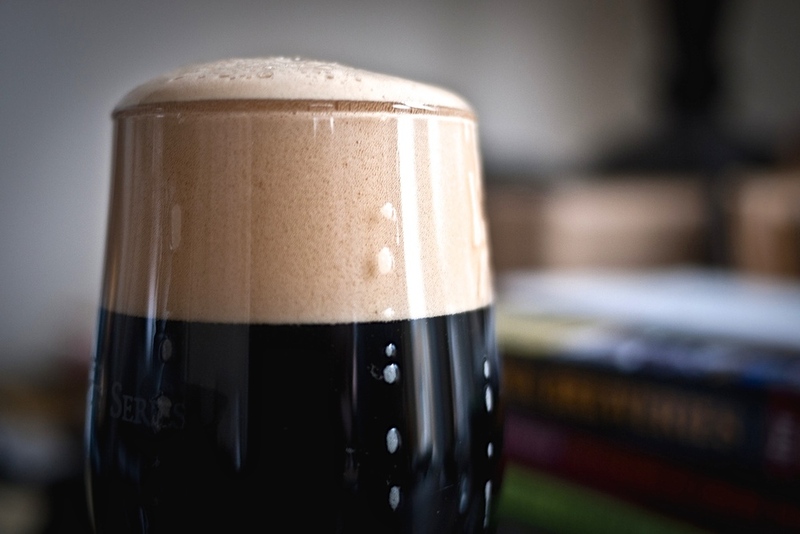 The main differentiator between Stouts and other beers is it’s rich, roasted flavor. It is also not uncommon for a Stout to be brewed with chocolate or coffee, intensifying flavors already present in roasted barley. Dry Irish Stout: classic stout, for example Guiness. Incredibly drinkable because of low ABV. Medium bodied and features deep dark color. Russian Imperial Stout: first brewed in England in the 1700s for the court of Catherine II in Russia. This beer was loaded with hops to ensure it made the long journey (hops act as a preservative). Oatmeal Stout: yes, Oatmeal Stouts are brewed with Oatmeal, giving the beer a fuller body, silkiness and an extra note of sweetness. Milk Stout: These stouts usually contain lactose and milk sugars, adding more of a sweet profile to the typical flavor of a Stout beer. The head (which is the foam) is usually thick and tan to brown. The body of the beer itself is very dark brown or even black color; in most cases completely opaque. The nose (scent) is quite grainy, and often will carry notes of coffee, chocolate, licorice and molasses. Although this beer is brewed with hops, it doesn’t carry much of a hop aroma. A mouthful is creamy, silky and full of flavor. The complexity of Stout makes it a perfect pair for many deserts with chocolate. And for the brave at heart a Stout beer float is a delicious way to fuse great beer with vanilla ice cream. That’s right, just go ahead and scoop your ice cream right into the pint glass. Also, Oysters and Guinness make one of the most famous beer food love stories out there. Other good flavors to pair Stout with: barbecue, sharp cheddar cheese dishes, mole sauce, braised beef, praline sauce, vanilla, cinnamon, bacon. Persian Dinner- Over A Fire!